Create amazing Android apps with C# and .NET - Bringing joy to Android development. Easily share code between iOS, Android and Windows devices. High-performance compiled code with full access to all the native APIs. Everything you love about .NET, including LINQ, Delegates and Events. Xamarin.Android makes creating Android apps easier than ever before. Thinking about supporting iPhone or iPad in the future? Reuse up to 90% of your existing C# code when porting from Android to iOS using Xamarin.iOS. Use your favorite .NET libraries in Xamarin.Android applications. Easily bind third-party native libraries and frameworks. The Xamarin Component Store offers dozens of third-party libraries packaged for instant adoption. Installing the Android SDK can be time consuming, but Xamarin's all-in-one installer simplifies the process. Get everything you need with only a few clicks. Xamarin.Android supports end-to-end development in Visual Studio-create, build, debug, and deploy apps from the comfort of Microsoft's IDE. Or use Xamarin Studio, a fully-featured IDE that is tailored for mobile app development. Xamarin.Android provides full access to standard Android APIs. Take advantage of the entire spectrum of rich functionality supplied by the platform. Explore APIs as you type with code autocompletion. 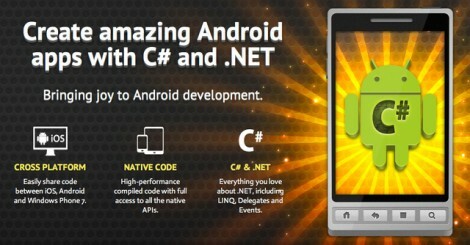 With Xamarin.Android, you can harness the full power of C# and .NET. Write shorter, simpler, and more maintainable code using features like LINQ, anonymous types, lambdas, and more. Use LINQ in your Xamarin.Android projects to query, filter and select data from in-memory arrays, or from databases such as SQLite. Handling XML is quick and easy thanks to the built-in XDocument class-just one of the thousands of .NET APIs available when you use Xamarin.Android. Easily handle button presses and other UI events. Use Parallel LINQ to automatically distribute heavy work, like parsing large JSON results, over both cores in a multi-core device.